Thermochromic inks or dyes are temperature sensitive compounds, developed in the 1970s, that temporarily change colour with exposure to heat. These can be either liquid crystals and leuco dyes. We use this technique in the manufacture of heat sensitive prototypes and product models specifically for industry. 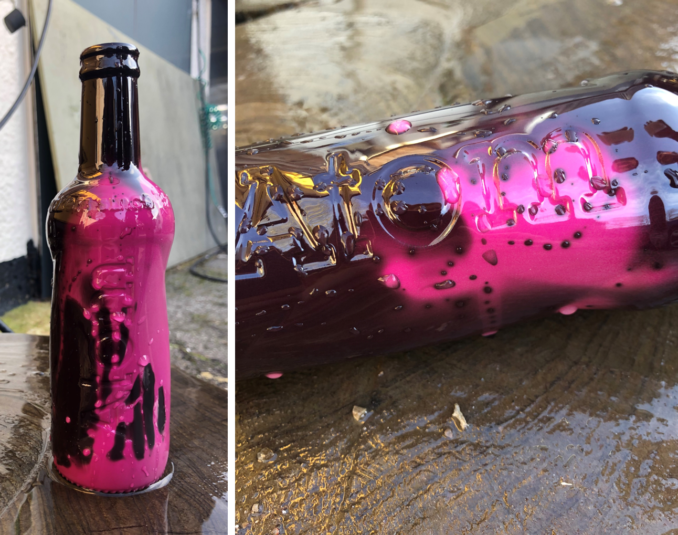 The images show Thermochromic paints applied to bottle mock ups. With the application of cold or hot water the change is immediate. Depending on the strength of heat applied and ambient temperature level, the colour can change or fade very fast or more slowly. This example used black to clear Thermochromic paint over a pink base. We can also provide custom made finishes for models which are reactive at very specific temperatures. The scope of application is quite broad for this medium given the depth and range of colour variations possible and we have lots of experience working with this special effect for product development or prototyping purposes. This may be to mirror the type of effect created under normal production or may be for research and development purpose. In each instance we work with client’s concepts to replicate the colour changing properties they specifically require, in a perfectly uniform finish. In general, Thermochromic pigment temperature activation can vary between -15°C for a chill and reveal cold activation, 7°C for touch and reveal, 31°C for rub and reveal or hotter for example around 47°C for hot heat and reveal activation. Most coatings and paints are also reversible with colours changes either temporary or permanent. Inks can be used in the raw material or for printing onto surfaces – textiles, plastic, paper and board. Thermochromic pigments have applications in all types of industries requiring temperature sensitive colour changes as visual aids or warnings and we can produce for any number of industrial uses including advertising, promotional products, UV awareness, graphics, Health & Safety, automotive, consumer and retail products, medicines, or electronics, in fact anywhere where the reaction acts as an indicator. Whilst Thermochromic pigments react to temperature changes, Photochromic pigments can be activated by exposure to UV sunlight or extremes of temperature in the atmosphere which require temperature changes to activate their properties. Hydrochromic pigments react and change colour when exposed to water. Photoluminescent pigments and coatings are a modern eco-friendly form of self-rejuvenating and sustainable output absorbing UV energy from conventional lighting or sunlight and releasing this over time in the form of “glow in the dark” light. Liquid Crystals are used in so many different products today they are now becoming so commonplace we are almost oblivious to the extent and effect of their uses on our lives. Using this technique to replicate industrial production in our model production is something we are proud to be specialists at.